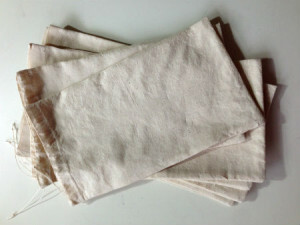 A handful of muslin bags for holding bulk food items. It should be more sturdy than those thin plastic bags as well as more environmentally friendly. You only need a bag full of flour fail once to be convinced that there has got to be a better way. Unbleached muslin and seine twine.